I am so excited for summer, which I know I have mentioned a time or two already. LOL But it is true! It has been raining quite a bit here in my part of Georgia as I know it has all over the country. 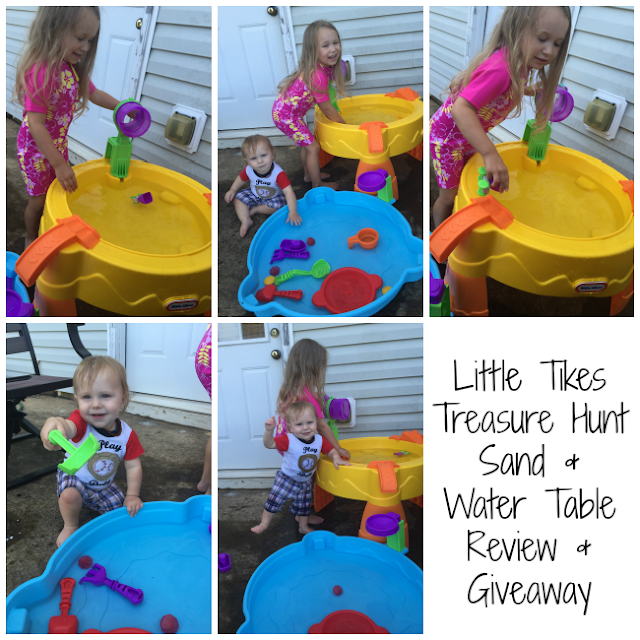 So I was very excited when we got to use our newest outside toy item, which was the Treasure hunt Sand & Water Table from Little Tikes. Since it has been so rainy lately, I just put water in it, but I have some sand that I will put in it later. From the moment we received this box, my kids were in heaven! They both were so excited to explore with what was inside. 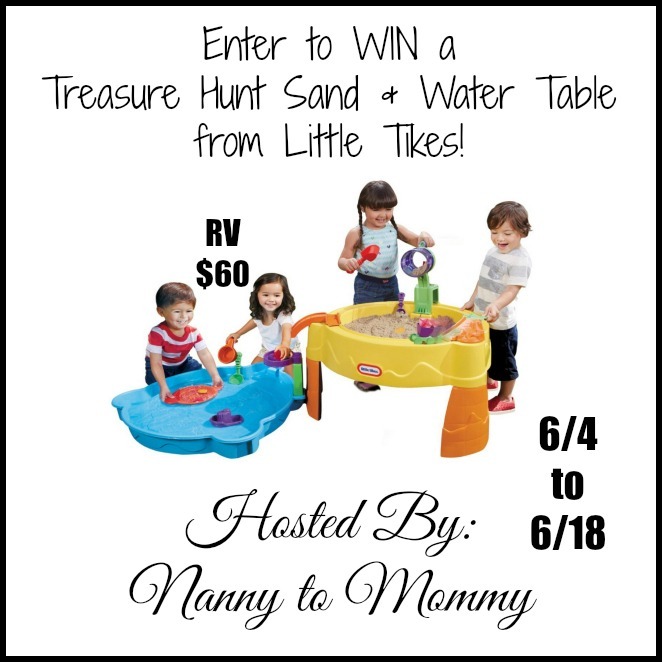 The Little Tikes Treasure Hunt Sand & Water Table was super easy to put together. All the pieces fit in place perfectly and I had no trouble at all reading the directions. My kids love all the pieces that come with this set, including a mine cart, gems, coins, and different shovels. I love that the blue top can be used as storage for when you aren't playing with it, so no animals can get in and you can feel comfortable leaving it outside. You can buy now on Amazon. And make sure to follow Little Tikes on Facebook. But you can also enter to win below! This giveaway is open to US only, must be 18+ to enter. All winning entries are verified. You entrant per IP address/household. There is only one required entry, all others are extra entries. Welcome to the Summer Lovin' Giveaway Hop! 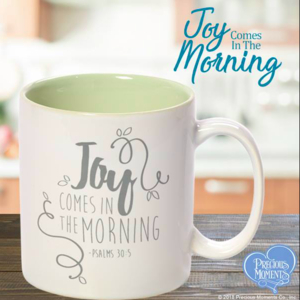 This giveaway hop is full of bloggers who are ready to celebrate the warm temperatures of Summer with some fabulous prizes. 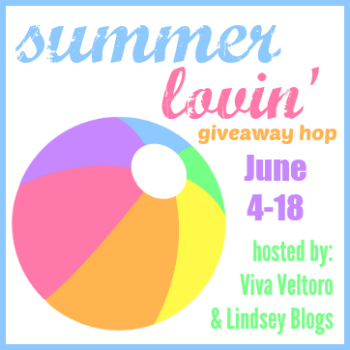 Be sure to hop around to them all, including the TWO Grand Prizes - the first on Lindsey Blogs at SEBG and the second over at Viva Veltoro! Nanny to Mommy, So Easy Being Green, Viva Veltoro, and the Summer Lovin' participating bloggers are not responsible for sponsors who do not fulfill prize obligations. 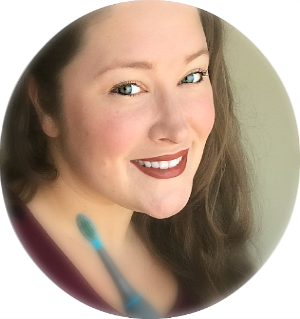 Although Nanny to Mommy received complimentary products to provide this review, all opinions are our own. 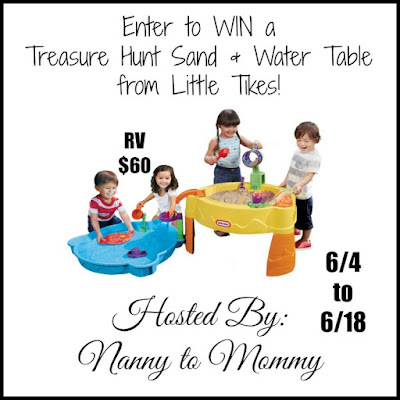 I would love the sand and sea play table! My kids would love it. I'm looking forward to it staying warm outside. My daughter would just love this. I'm looking forward to rest and relaxation. This is for my niece. I'm really looking forward to watching my girls grow as swimmers. This is their first time on a swim team. I am looking forward to being outdoors more with my grandchildren. I would love to win this form them. I can see them getting hours of fun out of this! Thanks! I'm looking forward to warm weather. My favorite little tikes product is the Cozy coupe. But my kids would love this sand/water table! I would love to win this for my niece and nephew. I look forward to visiting them and enjoying some summer sun with them. I like the little tikes cozy coupe and I love to chill by the pool for Summer. Lay out and enjoy the hot Arizona sun! I'm really looking forward to taking my 2 year old swimming. I think he'll really enjoy it this year! I'd love to win this table for him and his little sister. I really love their double easel, I'd love to get that too. If I won this it would definitely got to my grandkids and our favorite thing in the Summer is swimming! I am looking forward to the warmer weather this summer. I would love to get the Little Tikes cozy coupe! I would give this to my daughter. I'm looking forward to rest and relaxation. This is for my granddaughter. I am looking forward to having the summer off with my kiddos. 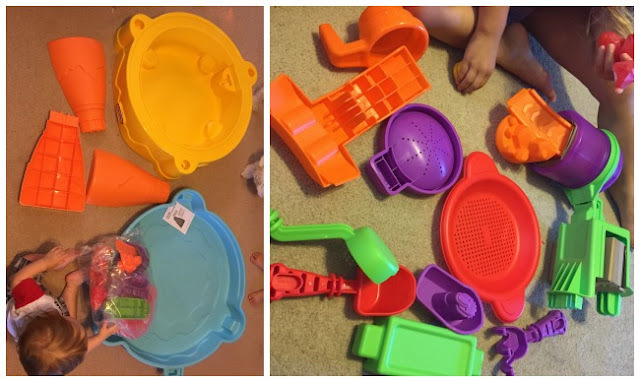 We love so many Little Tikes products especially if they promote the outdoors. If I were to win, we would be setting this amazing table up outside for my 3 year old and others that come over for parties during the summer. I would live this to my grandsons and I look forward to lots of pool fun with them this summer. I like the Little Tikes First Slide. This summer I hve a space to have a garden for the first time so we are looking forward to that. My daughter would love this sand and water table. She lives both sand and water. Or anything that makes a mess really! We are looking forward to bike riding this summer. I also like the Picnic on the Patio Playhouse Bundle. If I won, I would give this prize to my two older kids. They baby won't be able to enjoy it yet. but next summer he would! Thanks for the chance. I would give this to my son. It is definitely something he would love. I like the First Slide. I'm excited about going to my cousins wedding. I'm looking forward to doing exactly what we did today, spending our days in the pool! I'd love to get the Classic Castle for my kiddos, this prize would be for my 4 year old son and 2 year old daughter. We are looking forward to my sister and niece visiting for my son's birthday this summer. My son love everything they have but I think the Cozy Coupe is his favorite so far. Since my son is a water loving fool, I would have to keep this for him. I'm looking forward to spending more time with my grandchildren. I like the Play triangle and the Rainmaker for the youngest. I really like the Little Tykes toy boxes. They're so big and sturdy too. I would give this super fun toy to my grandson. He's 2 1/2 and would absolutely love it! I'm looking forward to camping and hiking. My granddaughter would love this. My little boy would love this table!!! 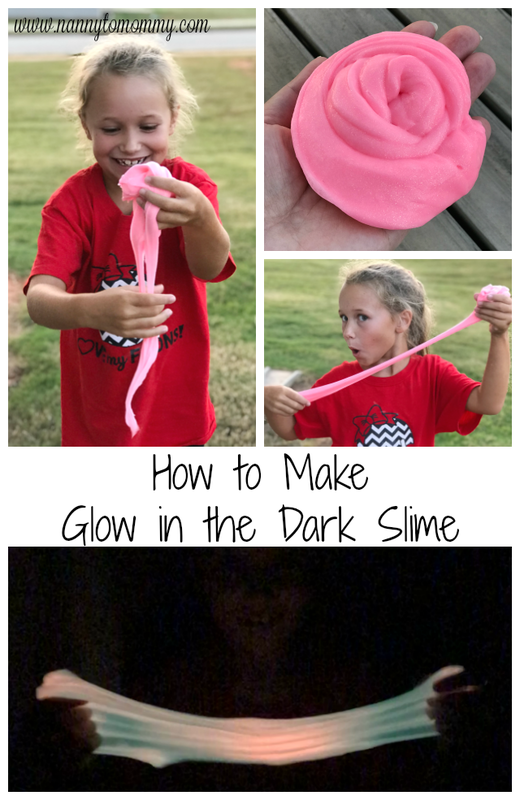 Its so cute and looks like lots of fun! I would love to win this for my granddaughter. I am looking forward to spending the summer with her and the rest of my family. I would love the cozy coupe! Just making more family memories this summer. Out summers are always filled with various events and this year isn't any different. Plus, I'd love to give this to my son. I'd like to win this for my two nieces. This summer I'm looking forward to camping and attending drag races. Thanks. I'm looking forward to going to the lake! This would probably be for our kids! I'm really looking forward to playing outside and hiking with my girls! It would be awesome to have the 2-in-1 Castle Climber- my oldest would love it. If I won, she'd definitely be the one using this water table! I'm looking forward to my first summer as a mom! This would be fun for my son when he's a little older. My nephew would love it now though. I am looking forward to swimming this summer and this would be for my 3 yr old daughter. I am looking forward to the warmer weather and going to the lake and the beach, and BBQ with the neighbors. I would give it to my grandsons. If I win I would give this to my grandkids they would have lots of fun with it. I am looking forward to pool time with my lil man and gardening. We planted some tomatoes, carrots, and herbs. I am loving working in the yard and garden. We love the Cozy Coupe, and our girls would love this. we're looking forward to a lot of gardening and exploring! my kids would love the giant waffle blocks!! I am looking forward to when my vegetable garden starts producing. I'm looking forward to swimming! We love Little Tikes slides. I would give this to my kids. I also like the Endless Adventures Fold 'n Store Picnic Table. I'd love it for my little ones. I'm looking forward to spending time with my 2 grandkids this summer. I would give this Little Tikes Sand & Water Table to them to have fun. I'm looking forward to giving birth to my first girl after four boys!! I love the Little Tikes Cozy Coupe. If I win the water table it would be for my youngest 2 boys. I'm looking forward to enjoying the outdoors with my son and husband! I've been searching for a sand and water table, and this Little Tykes product looks fantastic! My son would love to play with it. He just loves water, but has never played in sand yet! I love the Cozy Coupe also. I love all the little tykes water tables, they are super cute and perfect for summer. If I won I would totally keep it for myself, my two year old would adore it! I am looking forward to taking a few vacations with my family. I love their swing and slide combination set. I am looking forward to trying new things and making memories with my child!! I would love the bright and bold chairs and table set!!! I would give this to my son if I won! We're most excited for the beautiful weather so we can go outside more :) My son would love this, so he would get it for his birthday if we won! I love to go swimming during the summer and will be making time to do so at least once this summer. I'd love to get one of their awesome playhouses for my daughter! I am looking forward to many days at the pool, camping with my family, and just being outside as much as possible! I have 2 little boys and they would love to have this fun table! I am looking forward to playing with my granddaughter more. I also like the Cozy Coupe, but would love the win this giveaway for my granddaughter, Nellie. I'm looking forward to having my nephews come over and spend some time at our house. This would be so much fun for them. I would love to put this in my backyard and surprise them. I look forward to sleeping in during the weekdays because no school! And this would be for my daughter!